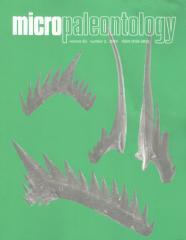 ABSTRACT: A superbly preserved discrete element conodont fauna has been recovered from carbonate concretions from the upper Desmoinesian (Pennsylvanian) Excello Shale at two localities in south-central Iowa. The multielement apparatuses for Gondolella wardlawi (new species), Idiognathodus acutus, Idioprioniodus conjunctus, and Neognathodus roundyi are reconstructed. Rare specimens of Idiognathodus tuberis (new species) also occur in the fauna.